Разстояние до летището 16,0 км. Имате въпрос към Yim Bangkok? 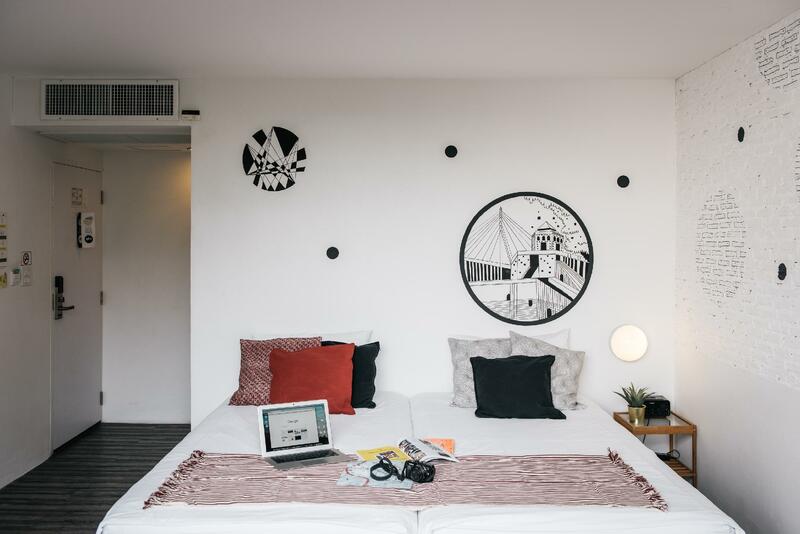 Удобно проектиран като за бизнесмени така и за почиващи туристи, Yim Huai Khwang Boutique Hotel е идеално разположен в Рачадапхисек - една от най-посещаваните части на града. Центърът на града е на около 7.8 km, а до летището може да се стигне до 26 минути. С удобното си местоположение хотелът предлага лесен достъп до всички градски забележителности, които задължително трябва да се видят. Съоръженията и услугите предлагани в Yim Huai Khwang Boutique Hotel гарантират Вашия приятен престой. Хотелът е оборудван със съоръжения като безплатен WiFi достъп във всички стаи, 24-часова рецепция, съхраняване на багаж, Wi-Fi връзка в общите части, семейна стая. Насладете се на висококачествените удобства по време на престоя си тук. В някои стаи са на разположение телевизор с плосък екран, хавлии, дървен/паркетен под, достъп до интернет (безжичен), безжичен интернет достъп (безплатен), които ще помогнат на гостите да релаксират след дългия ден. Хотелските съоръжения като градина, игрална зала са идеално място за почивка след тежък и уморителен ден. Открийте интригуващата комбинация от професионално обслужване и широка гама удобства в Yim Huai Khwang Boutique Hotel. Отседнахме 5 вечер/и в ноември 2018 г.
Travelled in a group of 4 and booked the room with double bunk beds. It was very cosy and comfortable. Staff were very friendly and helpful. 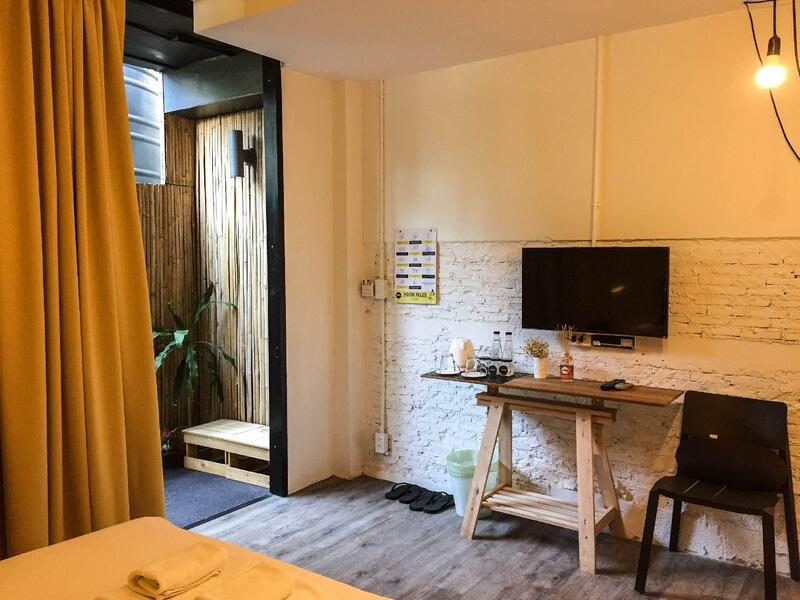 Location is very convenient - near the train station (about 5-7 minutes walk), 24hr convenient store is just next door and lots of massage places just across the road or nearby. Just a pity that we did not manage to spend much time utilising the facilities because our stay was very short and our itinerary was pretty packed. Great location near MRT like up to 5 mins. Friendly staff always willing to help. The private room in third floor is a little bit small but neat n clean with a big balcony. No fridge is kinda of inconvenient for the temperature of Bangkok. Overall it's good place for a short stay with reasonable price. It is 2 mins walk from mrt station. I love the modern design of the hostel. The beds were clean and comfortable. Loved it that they have cookies in jar. I was starving when i reached the hostel. Loved the breakfast too. The only complaint i have is the clog in the shower area. Other than that everything was great. The hostel is situated in a very convenient area close to Huay Kwang MRT station - just 3-4 mins walk. The convenient store (Max Value) is also very close, just in the adjacent building. The room is comfortable and well designed. I like the locker by the bed. It's big enough for my laptop and small racksack, so you can put things there and have more space by the bed. The common room is my favorite - the sofa is big and very cozy, and most of the time, there are not so many people there. Anyway, I need more space to put toiletry in the bathroom and it would be perfect if the complimentary coffee is available all day. I enjoyed my second time at this place. The room is big enough and comfortable with electric kettle and complimentary tea satchets. Common area is cosy and u can help yourself to complimentary biscuits and beverages. Very close to MRT. Walking distance to major shopping malls The Esplanade and The Street and the popular Rot Fai Market Ratchada. There were some disappointments this time -- housekeeping was slack, room aircon temp could not be adjusted, TV no signal much of the time. All said, it's still a place I'd re-visit. WARNING: On another subject, DON'T EAT at the nearby open-air eateries. On a rainy evening I saw a fat rat scampering over a spread of raw seafood in a large metal tray. The rain-soaked rat was struggling and wading over the raw meat, half-buried in the tray of ice and water, from one end to the other. At another open-air eatery in the same area, I noticed that the menu in Thai had all the prices shown, but the menu in English did not show the prices. Obviously they are out to fleece tourists. I hesitated booking this place at first because I was not familiar with its location, Huai Khwang. Fortunately I did, and I thoroughly enjoyed my stay at Yim -- a very short walk from Huai Khwang MRT. From this MRT, you can get to Chatuchak market in a few stops and it's also easy to connect to the airport rail link. The area is interesting to explore too whether it's street food, night markets or massage you're looking for. One of Bangkok's largest markets, Rot Fai Market Ratchada, and the huge Esplanade and The Street shopping malls, can be reached on foot or by MRT one stop away. 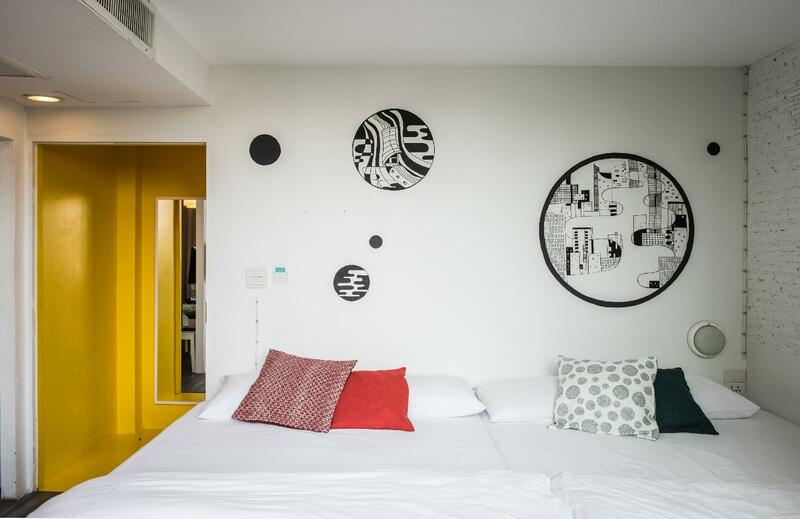 The hostel itself is furnished in a cosy, relaxing, hip and casual style. You'll find the common area conducive for work or for chilling out. My booking included breakfast and it was satisfying. One other thing that stood out at Yim was a kind of hipster spirit about it -- from the interior decor to the way the young friendly staff dressed and spoke. i've stayed in many hotels in bangkok. proximity to the train station is very important and this hotel is only 5 min away from the station. the surrounding area has a night market too. staff are all very willing to help and the price is definitely worth it for such a stay. I absolutely loved my stay at Yim Hua Khwang. The location was really close to MRT. The staff was what made my stay an absolute joy. From the time I had checked in until check out the staff always made me feel welcome with a smile. They seemed to be really happy to be working there. Отседнахме 6 вечер/и в декември 2014 г.
I stayed at balcony room with double bed for 6 nights. The hotel is well decorated, their staffs are very friendly and able to communicate in English. The location is great because it is close to MRT station and also night market. There is a 24-hours dimsum and steamboat shop next to the hotel. Convenient store is just the located at the building which next to the hotel. There is no lift in the hotel but you can seek help from the staffs. Our room is simple but comfortable, but the soundproof of the room is not that good because I can hear the vehicle sound, and if wake up too late then may hear the noise from the lobby. Housekeeping service should be improved as well, the cleaning service provided was not that detailed. Travellers who travels from or to Don Muang Airport can think of this hotel because MRT station has up and down escalators which easy for carrying luggages. I chose this hotel for the location. I was a girl travelling alone and my flight landed at night so I looked for a place closed to a BTS station. I stayed in a 4-bed dorm. 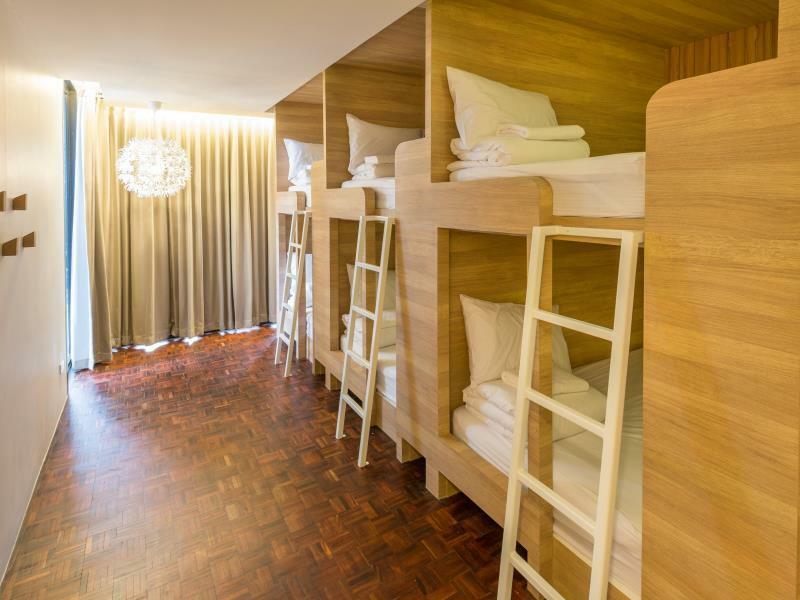 The way they set the bunk beds is quite smart. Everything was quite convenient in the room. Cons: 1. I love street food but there weren't many options in the neighborhood. 2. Room 206 washroom door has to be slammed to shut. (Every time someone used it at night, it woke me.) I forgot to mention it to the staff. Hope they fix it soon. 3. The check-out time is 12pm and I was still in the room but they shut the A/C off at 10:30am. I felt like they were telling me to get out. I'm not sure if it was intentional or accidental. Overall, I will probably use them again as I felt like I could talk to the staff if there was any problem. Not a lot of staff in Thailand are very communicative or helpful so I'm happy to give this hostel a 'Very Good' rating. Oh, the reason I gave only 3 to Food is because the coffee they sell was a bit overpriced and the beans weren't that great either. The staff was very help, it has lots of Chinese restaurants around and very close to MRT to go any where. It has a very relax atmosphere. Though the room very very bare, but super clean with very comfy bed. I like it! Room no fridge,u hv 2 share fridge at lvl 1..1st 2day got b.fast the next day no b.fast saying is a mistake..it's just a simple.b.fast toast jam n tea..with that fare I think the hotel Shud provide..it's really disappointing..3mins 2 mrt. Selected staffs r friendly n sincere,the young gal with short hair,the house keepeers n also a young boy that works as a volunteer there..however, for the others workers,they will still answer all ur queries if there is any..they dun change towel n replace new towel daily.. If they hv fridge in the room n provide a simple b.fast,I will choose this guesthouse again for my yearly trip 2 bangkok. There are lack of public toilet / bathing facilities in the hostel. Toilet / bathing facilities are only available in the room of each dorm. That means there is only one toilet to serve all people in each dorm in which has 4 or 6 travellers in the room. The public area is quite small surrounding reception. Location is good. Staff is helpful. Breakfast is simple when you compare with the other hostel in Bangkok. Air conditioner is fixed temperature for 27-28. Little bite hot at night. We had double bed and twin rooms with bathroom attached, value for money. Comfortable common area, clean bathrooms, clean beddings, warm reception, friendly owners, near 24 hr aeon maxvelu mart and 7-11 and train station 5-8 mins walk away. Staff are friendly. Location is near the MRT. Lots going on outside the hostel to the left and right. Cafe is a good workspace. Showers are weak and the floors could be swept more in the dorms. But overall, a great hostel. The location might be perfect for mongers as there is a big entertainment center for men bigger than Nana plaza. esplanade shopping is one met station away. The 6 bed dorm was full with 2 hostel staff living there. free bf simple but you can pay for nicer coffee at the cafe since this hostel is both a hostel and a boutique cafe. The facilities were getting aged since I was here in the past. But it is still clean. Staff friendly and hired some Farang. Small place but space efficient and better than many capsuletels in Japan. One of the best deals in bkk. Thank you Ben for your kind words. We'll keep up our cleanliness and friendly. There is a new night market next to Esplanade called "Train Market Ratchada" which we recommend for shopping and pub. Hope to see you again in the future. Yim Huai Khwang is very close to the station, around 5 mins walk. Great value for money, includes a very good cooked breakfast. Staff was super friendly, and the room was very clean. Good air conditioning, the balcony was minimal but nice to have all the same. Exceeded my expectations.